Please come yourself and urge all your contacts to participate in these Save Our NHS events that will take place in Nottingham and Notts on Tuesday 5th July and Saturday 9th July. The government’s Health and Social Care Bill aims to open up the NHS to ‘any willing provider’. If passed, this Bill will fundamentally change the way our healthcare is managed and paid for in England, and it will result in vast inequalities. Opposition to the bill is already strong. The British Medical Association (BMA) of doctors have called for the bill to be withdrawn despite recent amendments, saying it will not protect the NHS. As users of the NHS we must also make our opposition known. NOTTS SOS planning meeting: July 4th (Monday): Nottingham. ICC/YMCA, 7.30-9.00pm. Come and get involved with planning these events, and other anti-cuts activity. NHS ANNIVERSARY EVENT: July 5th (Tuesday): Nottingham. Protest against privatisation of the NHS from 4.00 pm to 7.00 pm at the London Road ‘BBC’ roundabout and help publicise the main city centre rally on Saturday. If some people could get there earlier at 3.15 pm this would be helpful as there are a lot of banners and placards to be erected. NHS ANNIVERSARY EVENT: July 5th (Tuesday): North Notts. Come to the NHS’s 63rd Birthday Party on Tuesday 5th July at Bassetlaw Hospital, 11.00 am—2.30 pm. Meet near Blyth Road bus stop. Bring a balloon! Download flyer. See also Worksop Guardian coverage of local NHS listening event on May 27th. SAVE OUR NHS MAIN RALLY: July 9th (Saturday): Nottingham. As part of the national day of action in defence of the NHS, Notts SOS will be rallying in the Market Square in Nottingham. We will rally at the Brian Clough Statue from 12 noon, followed by various activities around the city centre. Read press release. See Indymedia event for full details and list of supporters. Come and join this important event that will be happening across the country in many other towns and villages. Add your name to growing list of Facebook event participants. NOTTS UNCUT SUPPORT ACTION: July 9th (Saturday): Nottingham. Notts Uncut are planning a very special action to support Notts SOS’s NHS day of action. We will be meeting outside Boots (Victoria Centre, Parliament St.) at 10am and then moving on to a secret target, however we need people to be around for this throughout the day. If you can turn up at 10am – brilliant, and the longer you can stay the better. If you aren’t available until later in the day please call us after 10am on 07856565214 and we’ll tell you where to meet us. 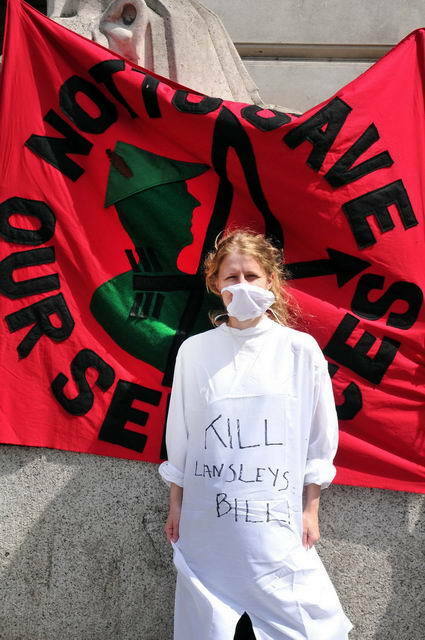 Bring your nurses outfits, doctors coats, banners, placards and lots of energy! More info: http://nottingham.indymedia.org/events/1898. Campaigners in Nottinghamshire will celebrate the 63rd birthday of the founding of the National Health Service (NHS) on Tuesday 5th July 2011, by holding protests warning of the threat it faces from the coalition government. In Nottingham, Nottinghamshire Save Our Services (Notts SOS) will take over the London Road roundabout from 4pm-7pm. They plan to use the event to warn of the threat to the NHS and also to publicise a larger rally in Market Square at 12 noon on Saturday 9th July. In the north of the county, campaigners from Bassetlaw Protecting our People and Services and Bassetlaw Save Our Services will hold a “birthday party” outside Bassetlaw Hospital from 11am-2pm. The protests are an opportunity to celebrate the NHS and everything it has achieved, but are also an opportunity to warn people about the danger posed by the Health and Social Care Bill, currently going through Parliament. Campaigners warn that despite the ‘listening exercise’ and government spin, the Bill still leaves the door open for private companies to take over the NHS. 1.Notts SOS will also be holding a rally at Speakers’ Corner (the Clough Statue) in Nottingham from 12 noon on Saturday 9th July. This will be followed by various activities around the city centre. These protests form part of a “day of action to save our NHS”.